I had a client contact me for an email consultation this week. She was frustrated as, despite following a ketogenic diet (where carbs are restricted to 30g or below, over 70% of calories should come from fat, and protein is moderated), she was unable to get into ketosis. I had a look at her food diary and could quite quickly see where I thought she could change things to help enhance her ketogenic approach. With her blessing, she’s allowed me to share this with a wider audience. Like many things, if one person is having challenges finding the right balance in their diet, there are likely many more people doing very similar things and potentially experiencing the same frustrations. I focused on some of the main issues I saw. You’ll notice there are foods that don’t align with ketogenic diets OR would be included in any diet for someone wanting to shed fat. We (the client and I) spoke on that in general, as clearly she knows this (i.e. cheesecake). The points I focused on were those that can trip people up that she might not be aware of. I’ve screenshot her food diary, and then my comments are below. 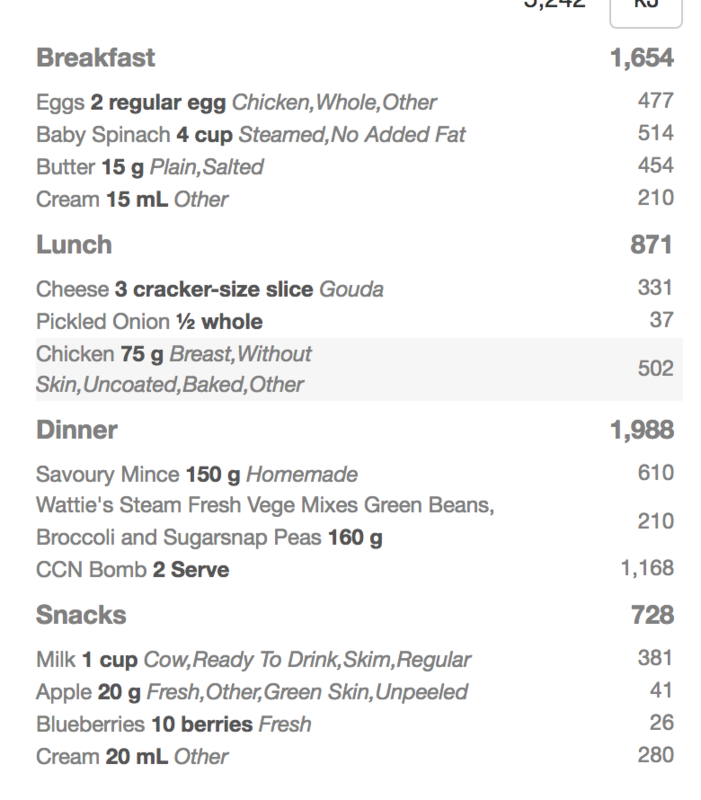 Major points – unable to get into ketosis despite sticking to under 30g carbohydrate per day. This is measured by a blood ketone meter, and she wondered if she needed to add more fat to do this. Her overall goal is weight loss. The thing with weight loss and the ketogenic diet, if you follow the advice from Phinney and Volek, pioneers of the ketogenic diet space, part of the energy your body needs to consume should come from your own fat stores, and not be provided for by diet. It’s a common misconception, as I see many people embark on a ketogenic diet for fat loss purposes but the opposite occurs – they gain weight. A common strategy at this point is to further reduce carbohydrate intake and bump up the fat. However, this will often further exacerbate weight gain (and frustration around the approach). Worst case scenario here is when the frustration leads to ‘to hell with it’ and that low carb diet is supplemented with all manner of processed refined carb junk food because ‘what’s the point? I can’t do this anyway, I’m useless and it’s not working for me.’ Clearly the end result of this self-punishment is further fat gain, some horrible carb cravings and a bad psychological state. Needless to say, I don’t think adding in more fat is the answer in this instance (and for this client), however I do think that tweaking what she is already doing is going to help. It’s also good to remember that blood ketones aren’t the be all and end all – these indicate ketones in your bloodstream but sometimes, when these are low, this just means we are using them for energy – which is what you want! This is more likely to be the case in an athlete rather than anyone who is generally just active. In this case example, I think the diet is the main reason for her not being in ketosis, rather than that the client is using ketones efficiently. However, it is worth remembering that if you are following a ketogenic diet and are not seeing the expected results on the blood ketone meter. Finally (and something I mentioned to the client) you don’t need a ketogenic diet to successfully lose weight, and sometimes focusing instead on the pointers I give at the end, regardless of ketosis, will give the same end result. Something like my online menu planner and individualised nutrition coaching. However, I would recommend in that instance to up the protein (double the recommendation I give you) and drop back the fat intake, as people often find that far more satisfying and easier to adhere to – which ultimately is THE most important thing with any dietary approach. 1.Milk – both the sugar in a cup of milk and the protein (whey) will raise insulin levels, thus put you out of ketosis. This is true of skim and standard milk. 2. Protein cookies: the type of sweetener/fibre used to make it a lower carb item can also spike insulin. For some people it is definitely a dose response thing going on – they can eat ½ cookie no problem, but a whole one will kick them out of ketosis. For any items like these, and if you do have blood glucose or blood ketone meters, it can be good to get a reading after a certain dose to see what effect they have for you. At any rate, highly processed goods can still negatively impact on blood sugar and appetite regulation in the absence of them being carb-based. 3. Coconut water – contains 3g sugar per 100ml or thereabouts. Any amount of free sugar in the diet is going to impact pretty quickly on your blood sugar levels if you haven’t just finished exercising, and kick you out of ketosis. The types of carbs you want to be having in your diet are specifically non-starchy carbohydrates -the majority of any carb sources coming from green leafy vegetables, other colour vegetables, perhaps some pumpkin/carrot depending on their effects on your blood sugar. 4. Grapes: any fruit is going to impact on your blood sugar levels, and particularly grapes – even if you stick within your limit of carbohydrate, the sugar from these are going to hit your bloodstream pretty quickly and cause an insulin response, thereby lowering ketones, especially if eaten outside of a meal that contains fat and/or protein (both of which slow down the glucose from hitting the blood stream). Fruit is typically best avoided on a ketogenic diet, aside from lemons, grapefruit, some berries. 5. Protein content of meals: for most, these need to be lower unless an individual is athletic. If struggling with getting into ketosis, it can be good to lower protein consistently to 1g/kg ideal body weight. For this particular client, this is 65g per day. Many days are consistently above this. In addition, the amount of protein in any one meal makes a difference – ideally, not more than 30g protein in any one sitting and, for you, likely 20g in a meal. This is obviously going to differ from person to person – as mentioned, athletes who have a greater energy output can generally get away with more protein (and more carbohdyrate) compared to a person who is sedentary or just lightly active. 6. Timing of food: eating within a restricted window (and not eating later in the evening) can help a ketogenic diet – our liver’s ability to metabolise carbohydrate is dictated in part by a ciracadian rhythm; we are naturally more carbohydrate sensitive in the AM, less so in the PM, so carbs are likely to spike insulin more in the evening. In addition, fasting naturally upregulates ketone production and can help accelerated ketosis. Further, snacking can (for some) keep them from being out of ketosis, so 3 meals, or 2 meals plus a snack is recommended. 1. Drop protein down in each of the meals so you are averaging approximately 20-25g at meals. 2. Time any foods that have a greater amount of carbohydrate in them for after exercise (ie lower sugar fruit, or nuts that have a higher carb count such as cashews). The body doesn’t need to rely on just the action of insulin to deliver carbohydrates to cells in this instance, as we have receptors called GLUT-4 receptors in our muscles and in adipose tissue that can take up carbohydate and are activated post-exercise. Remember, an increase in insulin suppresses the production of free fatty acids, the precursors to ketone bodies. 3. Engage in exercise to help upregulate ketone production – aerobic/weight training. 4. Fasting for 14h at a time to help body produce ketones. Now for women, fasting can be a great tool, but can also backfire (read more about that here). Generally speaking, the fasting approach can be something that is incorporated 1-2 x per week if fat loss is a goal, and on other days, opt for a 12h window between dinner one night and breakfast the next day. The most important thing, though, is to be aware of negative changes to energy, how you feel, mood and sleep patterns – all underlying signs of a stress response that you might not be able to cope with. 6. Remove drinks / foods that contain easily digested carbs even if they fall within the carb count for the day. You’ll feel far more satisfied (and it is far more nutritious) to get your carbohydrates from green leafy vegetables which also contains a good amount of fibre. 7. Dairy – stick to hard cheeses and forgo the softer cheese/milk. These are just some pointers from this client’s diet; another practitioner may pick up others. I will reiterate my point, however, in that a ketogenic diet, when done purely for weight loss, isn’t always the best approach and, for alot of people, unsustainable and too much like hard work. If you’re struggling to get the balance right and not seeing the results, then there are definitely other alternatives out there – one which will fit your lifestyle, eating behaviour, budget and allow you to lose weight with far less effort. It’s adherence that is key. Let me help you with that. Delicious, nutritious food regardless of your dietary approach. Intermittent fasting is an increasingly popular phenomenon among people wishing to improve their body composition and their overall health – almost as much as consuming the latest superfood. Intermittent fasting (or time restricted eating, as it is known in the scientific literature) is when we restrict our eating during the day to a window of from around 8 hours to 12 hours, and has been popularised by the fitness industry in recent years. There are different ways to approach it, though from a health perspective, eating earlier in the day to allow for the feeding to align with our body’s circadian rhythm may optimise the health benefits for overall longevity. Fasting has been a practice undertaken for centuries in some cultures, and research reports favourable effects on many markers of metabolic health, including blood lipid profile, blood glucose metabolism and hypertension when these populations have been studied. More recently, researchers have investigated different time restricted feeding protocols in relation to risk of cardiovascular disease, neurological disorders, diabetes and some cancers using rodent and human trials. The longer time spent fasting may have pronounced health benefits, though recently a more conservative method (of even an 11 hour fast) has emerged as being beneficial for certain populations. Indeed, time restricted eating is being thought of as an easy to implement, effective lifestyle intervention that could help improve appetite control, markers of overweight, inflammation, blood glucose metabolism and hypertension, all reducing risk of cardiovascular disease, diabetes and some cancers. This recent small study found that late night (or prolonged eating periods) increased fasting glucose, blood triglycerides, insulin and weight gain. When healthy adults eat meals that are identical in terms of macronutrients (ie carbohydrates, proteins and fats) and caloric load at breakfast, lunch and dinner, the postprandial (ie. after eating) glucose response to the meal is lowest after breakfast and highest after dinner, even though the meal is identical. This is one example which suggests that our metabolism, and response to food, changes across the course of the day (see here). We are diurnal creatures – we do most of our activities during the day (including eating, working, exercising) and we rest at night. This is controlled by our internal clock in the brain, the superchiasmatic nucleus (or SCN) which in turn influences smaller internal clocks (or oscillators) in the peripheral tissues of our body. These clocks control thousands of genes within our body, including those that regulate our metabolic processes, which accounts for around 10% of our entire genome. While light is the major cue for the SCN in our brain, timing of food intake influences the circadian rhythm in the other tissues, including the liver, which has implications for metabolism. This tells us that our basic metabolic physiology is supposed to behave differently according to the time of day – this is everything from making neurotransmitters, to making insulin, to glucose transport inside of cells, to fatty acid oxidation and repairing cellular damage. It makes sense then that when we eat has just as important implications for our health as what we eat. Research investigating the health effects of fasting has found that anything that breaks the fast will break the fasting period, including no calorie options such as black coffee and even herbal teas. This is because there are compounds within these fluids that require breaking down by the liver. That is not to say that people don’t experience benefits from fasting if they consume a hot beverage earlier in the day (as is often recommended to help get through the morning hours and comply with a 16:8 protocol) or limited calories (for example, 50 calories), however longevity benefits may well lie within the strictest definition of fasting. With the advent of artificial light, and the changing structure of work schedules (combined with the increasing busy-ness of everyday life), this has elongated the period of time that people eat, which has negative health consequences. While you may have heard in media reports of scientific studies that eating late at night makes no difference to overall weight loss, the focus on weight ignores the more important, underlying metabolic and chronic disease risk that eating late into the evening can have on health outcomes. It may be easier to regulate appetite too, as research suggests that appetite hormones respond more favourably to eating earlier (8am to 7pm) than later (noon – 11pm), and the level of satiety achieved with this could prevent overeating. This is relevant with time restricted feeding as research has shown that more frequent eating patterns can be detrimental to metabolic health if consumed close together. One study found that participants who ate excess calories consuming their food over three meals and three snacks had increased visceral (stomach) fat deposition, liver triglycerides and lower liver insulin sensitivity compared to those consuming the same number of calories over three meals. 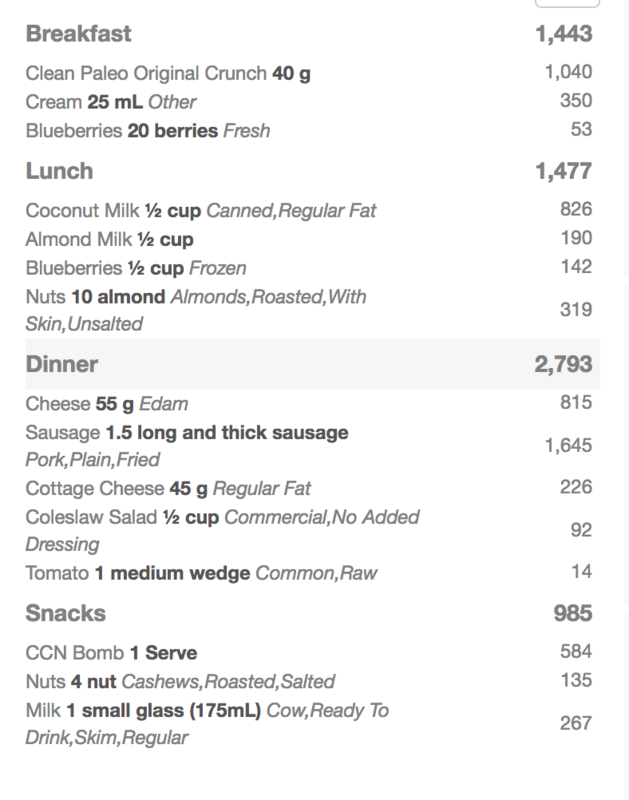 The snacks were consumed later in the day, and after each meal, so elongated the overall eating period. Animals limited to 9-12 hours feeding period, but not limited in the number of calories they eat have experienced benefits including decreased fat mass, increased lean muscle mass, improved glucose tolerance and blood lipid profile, reduced inflammation, higher volume of mitochondria (the energy powerhouse of our body), protection from fatty liver and obesity, and a more favourable gene expression. In humans, research studies suggest that eating within a time restricted window of 11 hours (say, 7am to 6pm) is associated with a reduction in breast cancer risk and occurrence by as much as 36%. Earlier eating time has resulted in more effective weight loss in overfat people, and every 3 hour increase in fasting duration was linked with 20% reduced odds of having an elevated glycated haemoglobin (HbA1c), a marker of long term blood sugar control. For every 10% increase in calories consumed after 5pm there was a 3% increase in c-reactive protein, a biomarker used to measure inflammation (the underlying process that, when elevated long term, can influence risk of diabetes, cardiovascular disease and some cancers). Finally, when meal times were constructed earlier in the day this resulted in a 10% decrease in c-reactive protein. Eating within a 12-hour window improved sleep and weight loss within an otherwise healthy population. You can see then, the myriad of potential benefits to eating within a time restricted eating – could it be worth trying to fit into your lifestyle? And if so, how to do it? There are many different time restricted eating protocols to choose from – and the type of fast you choose to do really comes down to what works for you. The 16:8 protocol that seems to be most popular is a little aggressive for anyone new to fasting, and this may ultimately leave you feeling hungry, cranky, and vulnerable to overeating later in the day – undoing any potential health benefit that has been shown in the research. Indeed, many people I see that try this as their first experience report that they can successfully get to 11am or lunchtime without eating, but once they are home from work, no amount of food will keep them full, eating right up until bedtime. My advice is to start a little more conservatively. Given that (in an ideal world), we sleep for 8 hours a night, not eating in the 3 hours leading up to bed time should be a good place to start for most people, thus it gives that 11 hours where some of the health benefits begin to be realised. From there, once adapted, you could try to push it out by an hour. While the most potent benefits occur with the strictest definition of fasting, the blood glucose and lipid improvements, along with fat loss can still occur in those whose definition of fasting refers to calories, not coffee and tea as mentioned above. That the benefits occur in the absence of caloric restriction is important to reiterate, however by restricting the eating period, many people also reduce overall caloric intake, which can further improve overall metabolic health and body composition. Fasting doesn’t appear to be something you must do every day to see the health benefits either, and even 3-4 days a week could be beneficial for metabolic health. That said, this reduction in calories and extended time NOT eating may not be good for all, especially if your notice increased anxiety, sleeplessness or disruptions in hormone balance, so it is always best to proceed with caution. It would also be prudent for any individual with a health condition to discuss with their health professional before embarking on time restricted eating, especially the more aggressive protocols. (PS I’ve got dates booked for Nelson, Wellington, Dunedin and Christchurch for my talk! Click here to find out more details, would love to see you 🙂 ). Last week I posted three reasons why many people undertaking a LCHF diet stall with their success or never get it off the ground to begin with. The following delve a little deeper into the less obvious reasons why people struggle with their diet, and offer some options to help troubleshoot. Fat doesn’t fill you up. For some people, they don’t feel satisfied when swapping out their carbohydrate for more fat. If it takes a few handfuls of nuts or half a block of cheese to feel satisfied, then there can be some serious increase in calories that isn’t compensated for by an appropriate increase in satiety from the meal. Yes, cheese and nuts contain protein, but to be honest I treat them more as sources of fat than I do protein. If this is you, then. Increase the portion of protein you are consuming with your meals. I know many people are scared to consume more protein because protein can be broken down into glucose in the absence of carbohydrate, therefore pushing up their blood sugar levels. For people on a ketogenic diet (where 80% of their calories should come from fat), or those metabolically damaged (whereby there is a dramatic change in blood glucose response from a protein-rich meal), this may be a problem. For most people though? upping protein by 1/3 of a serve is no biggie. Still hungry? Up the protein some more. Drop out some fat –make room for the added protein by dropping out some of the fat – you could start with ½ – 1 serve and see how satisfied you feel when you do that. A serve of fat is typically 1 tablespoon of oil or butter, or ¼ avocado. Spread your food intake out across 2-3 meals to lighten the caloric load and see if this makes a difference to your energy or other more objective markers mentioned above. Remember you’re still a rockstar even if you have to eat more often. You’ve got a high intake of dairy or nuts. Some, especially women, are not suited to high amounts of dairy or nuts, and when the begin to include more of these foods – ones they’ve avoided for years due to their fat content – they have a weight loss stall they can’t move past or, worse, they begin to store fat around their middle. While some suggest cheese is a food akin to crack, research investigating the addictive properties of the protein in cheese have not found this to be the case. Of course, if you personally can’t stop at one slice and find you’re eating the block, then perhaps it is for you. Nuts can also be trigger foods for some people, and they find it difficult to stop once they’ve started eating them. Ditto with a jar of peanut butter. What to do? Omit dairy for 30 days – sometimes it’s not the dairy per se, it’s the amounts that you’re eating it in that need to change. Removing it entirely will allow you to change your habits and then reintroduce it. Omit nuts and/or nut butter as per above in #6a. Swap snacks to those that are predominantly protein-based rather than fat based – despite the satiating effects of fat, for some, it’s just not like having protein. A hardboiled egg or some leftover chicken wrapped in lettuce or nori sheets (my current obsession) may satisfy you more. Are you losing weight? If so, then wait until your weight stabilises and then retest your numbers – your body recycles triglycerides that are released from adipose (fat) tissue, therefore your triglyceride levels can appear high, but it is transient. Don’t get your cholesterol levels measured if injured, if you haven’t slept properly or you’ve been under significant stress. Cholesterol levels can change easily based on environmental triggers. Some people notice their cholesterol increases specifically in response to dairy fat, others to coconut fat – experiment for 6-12 weeks by dropping these out of your diet and get your cholesterol levels retested to see if this brings a drop in your numbers. Replace it with foods that have a more balanced fatty acid profile (such as lard or beef tallow) and foods high in monounsaturated fat or omega 3 fats, such as avocadoes, olive oil, nuts, seeds, salmon, mackerel, sardines. Here’s one I prepared earlier (and by ‘one’, I mean, ‘post on reducing your cholesterol naturally’. And by ‘naturally’ I mean ‘without Flora Pro Activ’). Get more in-depth testing of your cardiovascular disease risk profile – cholesterol is one measure and possibly not the most important one. CRP, fibrinogen, LDL particle size, number, oxidation and patterning can all give you more information than the run-of-the-mill lab test can. Contact me as I can help you arrange this testing which, for the most part, your doc might not even be aware of. Consider getting tested to find out your genetic predisposition (either through your doctor, or I can assist via Fitgenes gene testing). Consider dropping your fat intake, upping your protein intake and perhaps your carbohydrate intake too – ala the Zone diet approach. Despite its gimmicky name, it’s proven itself to be very effective for blood sugar stabilisation and blood cholesterol management. Some people just aren’t meant to eat a higher fat diet. Follow a lower FODMAP approach to see if removing these foods settles down your discomfort. Doing this for at least 21 days and reintroducing a different food one at a time can pinpoint which one in particular might not agree with you. Introduce fermented foods as per #3e above to re-establish healthy bacteria in your gut. Replace dairy fat for alternative fat choices: nuts, seeds, avocado, coconut oil, beef tallow, lard. Ensure you chew your food properly at each meal to break it down, include lemon juice in water in the morning, and apple cider vinegar with meals to stimulate your digestive system, and consider ox bile supplement or a digestive enzyme that has lipase and/or pepsin enzymes to help you break down the fats and proteins. You’ve upped your alcohol intake because red wine and white spirits are “allowed” on LCHF. This might not even be intentional, but dropping your carbohydrate intake can lead to increased alcohol cravings, especially if your fat intake is too low, or your food intake is too low, or your stress levels are chronically too high. Or perhaps, you enjoy a moderate amount of alcohol but are continuing to gain weight on the LCHF diet. Be honest about how much you are drinking. Regularly consuming a ‘large’ as opposed to a ‘standard’ pour at the pub? Cracking open a bottle one night and then drinking to finish it off? Your plan to be alcohol free during the week has reduced to being alcohol free Monday – Wednesday? Evaluate if this is a problem for you … or not! Go alcohol free 5 nights a week, and enjoy a glass of whatever you fancy on the other nights. Ideally not those lolly water vodka mixes, but if you don’t like red wine, then choose something else. It’s not a deal breaker. Eat enough during the day so you’re not craving alcohol in the evening. This may mean including some additional starchy carbohydrate in your lunch meal – it doesn’t mean you’re not ‘low carb’ – as that in itself is a spectrum. This can really offset your cravings. Try it for 14 days to see if there is an effect. Lighten the load by choosing to have a low-fat meal if you drink. Old Skool 90s ‘dieting’ approach – those fat calories will only be missed by your adipose tissue, which is where they will be directed to when consumed with alcohol (which is processed first and foremost). Drink to ensure you are hydrated before you have your first alcoholic drink. This is like 101 really – we always drink more when we are thirsty, and then when we drink more, we become uninhibited and then all hell can break loose, right? Food timing: If you’re beginning your day with breakfast at 7am and winding down with a cup of tea and some dark chocolate at 10pm, you may be doing yourself a disservice. Eating over a time period of more than 12 hours can be deleterious to health. Recent research has found that restricting the eating period to 12 hours or less can improve insulin resistance and glucose tolerance, and reduce breast cancer risk even when the calories remain the same. Anything you consume that requires processing of any sort by the liver – including black coffee or herbal teas – will begin the metabolic process. When we eat is also important as our appetite hormones are on a circadian rhythm (food being an important signalling molecule for hormones), and eating late at night – even if overall eating window is short – can be problematic for your liver. The benefits derived from intermittent fasting (such as these) can still be realised if your version of fasting includes coffee in the morning, however it appears actual fasting (nothing but water) for at least 12 hours is most beneficial for metabolic health. Try to keep within a 12 hour window for consuming anything other than water. If you struggle with remembering to do this, there are apps that can help. It’s not as hard as it might seem – if you have breakfast at 7.30am and are done eating by 7.30pm then you’ve nailed it. You’ve focused entirely on diet without giving pause to consider other aspects of your lifestyle that contribute to your wellbeing. Lack of sleep, chronically elevated stress levels, over or under activity can all contribute to some of the common complaints people attribute to diet which have nothing to do with the food. Evaluate your sleep – are you getting to bed at a reasonable hour? Able to sleep through the night with ease? Feel refreshed waking up? Evaluate your physical activity – are you doing enough? Are you doing too much? Evaluate your stress levels – are you trying to do too much? Feeling overwhelmed? Or conversely is there not enough stress to keep you stimulated and motivated? Of course these factors contribute to how your body responds to the food, but it isn’t the food per se. As I said last week, this isn’t a definitive list, however if any of these resonate with you then try some of the ideas I’ve listed, or enlist the help of someone like me to guide you to the best approach for you. It’s about this time of year that I start seeing people come through my doors needing some minor (or major) tweaks to their LCHF eating approach. There are usually one of two scenarios. Scenario #1: When they embarked on LCHF they saw ALL of the benefits they heard about, effortlessly shedding body fat, boundless energy (in training and afterwards), improvement in skin tone, hair condition, sleep and digestive problems. But lately the opposite is true. Despite seemingly nailing this LCHF lifestyle, they’ve noticed they are lacking energy, gaining weight (especially around the middle), latest blood tests have seen their cholesterol levels have shot up (and perhaps triglycerides), they are unable to sleep… … yet if anything, they’ve instigated (and nailed) the hacks they’ve read to optimise their LCHF eating approach. What gives?? Scenario #2: They’ve given it a good go on their own for the last 5 weeks, following it to the letter and despite this, it’s ‘not working for them.’ Worse, their husband/workmate/training partner has taken to it with ease. While we are all individual as to what is going to work for us, the LCHF approach is a really good one for most people, most of the time. Despite that, there are small things that can derail your best efforts to improve your diet, so I want to cover off the basic (and more nuanced) reasons people don’t fare well on a LCHF approach, and some tips on how to overcome them. I’ve ended up splitting this post into two parts as it was so long! Too low carb. The internet is a wonderful and terrible thing – information is everywhere, everyone is an expert and the version of paleo/LCHF/JERF that you’ve adopted based on what others are doing may well be too low carb for you. LCHF is a spectrum, and what is low carb for one person may well be higher carb for someone else – generally speaking, anything up to 200g of carbohydrate/day could be low carb. It all depends on context. I see a lot of people who are trying to stay strictly below 25g of carbohydrate a day – too strict (and unnecessary) for most people. Even Prof Tim Noakes, staunch advocate of a LCHF approach to eating (“banting”) has loosened up on this. The people who really benefit from a diet this low would be those embarking on it for therapeutic reasons: diabetes (both types), epilepsy, cognitive health (Alzheimer’s, for example). That’s not to say that others out there can’t make this level of carbohydrate work for them. But if you’ve noticed fat gain (especially around the middle), irritability, hormone imbalances (such as a missed menstrual period), lack of energy (past the initial phases of the LCHF approach), irregularity of bowel motions, sleeplessness – to name a few symptoms, then you may have gone too low. What to do? 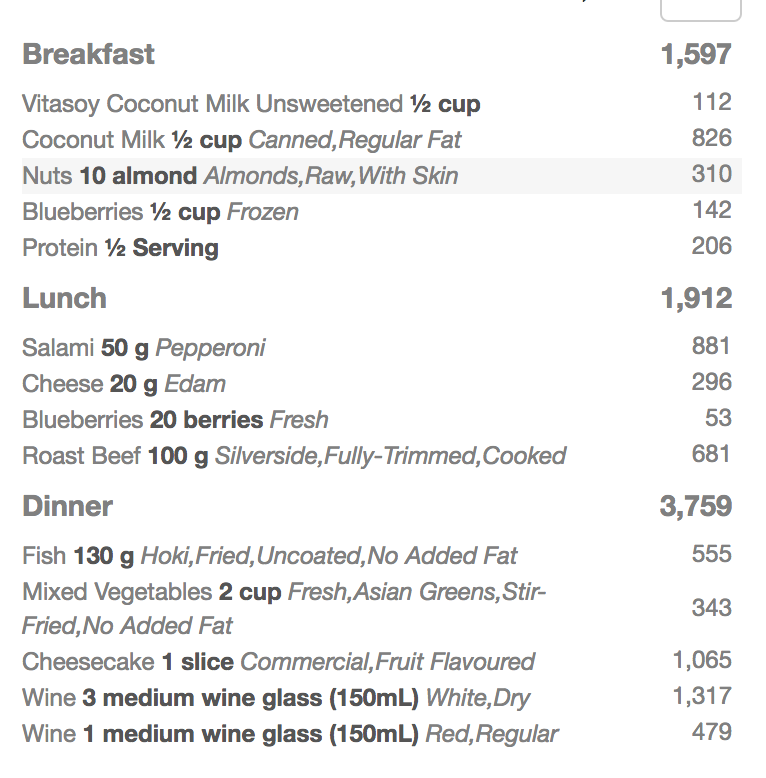 Track your diet for 4-5 days to get an average of the grams of carbohydrate you eat per day. If it’s on the very low end of the scale (less than 50g*, for example), then try adding back in some good quality starch to see if any of your symptoms improve. Don’t be pedantic about vegetables. Really. That includes carrots and tomatoes. To be honest, you don’t have to track your carbs if you’re not a numbers person – but it can be a good way to assess if this really is the problem. 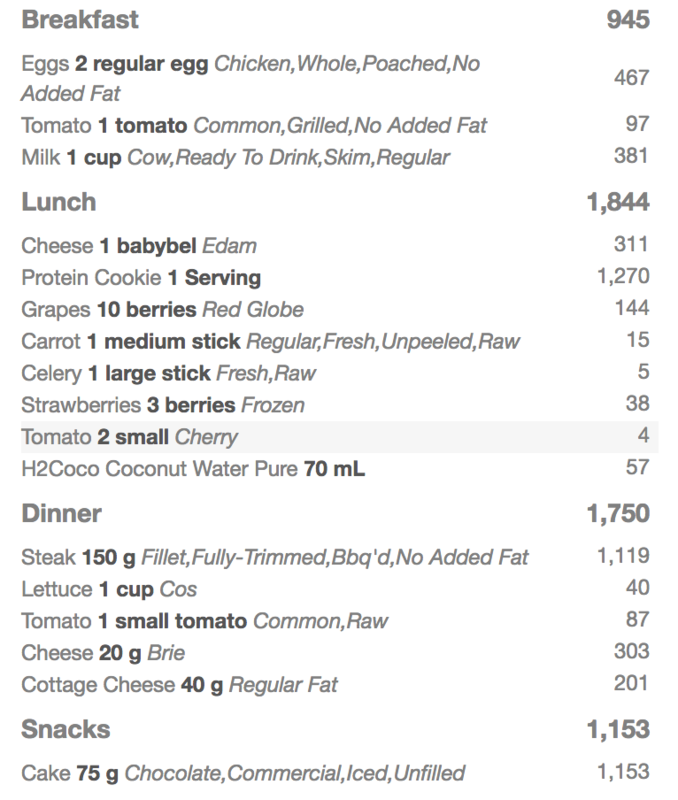 Use My Fitness Pal, Cron-o-meter, My Net Diary or Easy Diet Diary as nutritional tracking tools. (If you’re embarking on a lower carb diet, this is a good first step regardless, so you don’t make the jump from 400g a day to 60g a day). If your carbohydrate intake is in the realm of 80-100g carbohydrate, you may not be too low, it might be more of a timing problem – ensuring you have carbohydrate in the meal after a high intensity (i.e. CrossFit or F45) or long duration exercise session can help improve recovery and alleviate a lot of fatigue/irritability. If you’re struggling with insomnia, then adding in some kumara or potato into your evening meal increases production of precursors to melatonin. Is it more protein you need? Protein can help keep you fuller for longer, stabilise blood sugars (therefore has implications for focus/energy/concentration), promote recovery and help with sleep. Many people fear protein because of the potential for it to be converted to glucose in the body (via gluconeogenesis). For someone following a LCHF diet this isn’t an issue. Try upping your protein portions by 1/3 – ½ at each meal. If it’s in the initial phases, then up your intake of sodium – to levels more than you think you need. When we drop the carbohydrate content of the diet, we drop a lot of water stores too (hence a rapid loss on the scales) – this is because for every gram of carbohydrates stored, we store an additional 3g of water. Add salt to your meals, a pinch in your water bottle, make a miso drink or drink bone broth. Not low carb enough. I see this a lot. People equate carbohydrate to bread, pasta, rice and cereal and don’t think about other foods that are predominantly carbohydrate –fruit, dried fruit, ‘green smoothies’ with a fruit base, bliss balls, natural fruit and nut bars… In addition, many products are promoted as ‘sugar free’ when they contain dried fruit, maple sugar, rice malt syrup or some other type of natural sweetener. This may seem elementary to you, but I know many people are confused by this point. Regardless of what you hear, sugar IS just sugar – that one sugar is lower in fructose doesn’t mean it’s not going to influence your blood sugar levels, it’s likely to affect them more. This has to be my biggest bugbear of the ‘real food’ movement; not that these products contain sugar – but that they are marketed as not. This is no better than being told that Nutrigrain is healthy. We all know that’s not true. Again, track your numbers (as per above) via a tracking tool. A lower carbohydrate approach is not a fixed number, it’s a spectrum. But if you’re still consuming over 200g a day and not engaging in regular physical activity, then something might need to be tweaked (especially if you’re not seeing the results you’re after). Get rid of the bliss balls, the dried fruit, the paleo muffin or the smoothie from your favourite juice bar that you thought tasted suspiciously sweet for something ‘green’. Read the ingredient lists on the packages you buy. Sugar has over 56 different names. You probably don’t need to know them all, but it would be good to have an idea, right? Too many processed foods or snacks. Even if you’ve found a sweet spot with your macronutrient intake, having too many processed ‘low carb’ snacks can continue to drive your appetite hormones in a way that favours eating more than you need. Leptin is a hormone produced by fat cells that tells the body when we’ve had enough to eat, and is involved in the regulation of calories we burn and body fat that we store. A consequence of being over-fat is high circulating leptin levels in the bloodstream, and the brain stops reading signals sent by leptin that we’ve consumed enough food. Instead, it incorrectly believes that we are starving, thus we feel hungrier. Excess body fat increases Inflammation in the body, and is one of the drivers of leptin resistance, and processed food can drive inflammatory pathways in the body – even low carb processed food. And if you’re not over-fat? Well, vegetable oils and certain additives and preservatives found in these foods can drive inflammatory pathways in the body. In addition, an overabundance of processed flours may cause disruptions to our gut microbiome as they are easily digested, perhaps not even making it to the gut bacteria in our lower digestive tract. This can mean we are starving our good bacteria and instead feeding bacteria that release endotoxins, causing increasing inflammation. This can have a secondary effect of increasing your cholesterol level (see this post here). These foods are created in such a way to send signals to your brain’s pleasure centre and drive your appetite for more food that you just don’t need. One of the benefits of a real food approach (which naturally lowers your carbohydrate intake) is that inflammation reduces, insulin drops, gut bacteria can rebalance and the signalling pathways in the brain that regulate your appetite hormones can begin to normalise. Get rid of most foods or snacks that come in a package with ingredients you don’t recognise. Eat real food. Base your snacks around hardboiled eggs, cheese (for the dairy tolerant), vegetables, leftover meat, macadamia nuts, egg muffins. Drop the nut flours. Just because they’re low carb does not mean it’s a free for all with these processed flours. Increase foods that help balance out your fatty acid profile: more fatty fish (such as salmon, mackerel, sardines) and (grass fed) meat for omega 3 fats. Consider taking a fish oil or algae omega for those who don’t eat fish – and be picky about the supplement! Take care of your gut: consider a probiotic for 30-60 days (such as Lifestream Advanced, Inner Health Plus, Syntol or Prescript Assist) to help populate the gut with the good guys, but also keep them fed with fermented foods such as sauerkraut, raw apple cider vinegar, water kefir and an abundance of vegetable fibres. I’ve got more – quite a bit more actually! – but will post that in Part 2 so as not to risk losing your attention ;-). These are three of the basics that people can get wrong (particularly in the initial phases), and the next post will cover some of the more nuanced reasons, and what you can do to correct them. If you’re not sure whether your LCHF diet is working for you, why not jump on and book a consultation with me? An expert eye can help take the thinking out of it for you and save a lot of stress long term. Fear of fat holding you back? Guilt-free. A term I used to throw around with reckless abandon when talking about food and nutrition. Regardless of your nutritional leanings, you see this everywhere with reference to foods you ‘should’ be eating and foods that shouldn’t be on the menu. Even though the term itself is referring to a supposedly innocuous food choice, it’s the unintended message that no longer sits well with me. The very notion of ‘guilt-free’ foods implies that we should feel guilty or ashamed for eating foods that are not desirable. Over the last couple of years I’ve moved away from thinking about food in this way. It wasn’t even a conscious decision – I just noticed that I used the term less and less when discussing food choices with people, making me more aware of the term when I saw it. Our eating behaviour has so much more to do with psychological, sociological and emotional factors than just the food itself. If a food is deemed to be ‘guilt-free’ then often times it’s a version of a food we typically associate with being a treat: such as a muffin or cake. That it now contains meedjol dates instead of refined sugar, or almond flour in place of wheat flour gives it an immediate ‘health halo’ and we treat it almost like a health food. Which, clearly, it isn’t. Similarly, a food deemed as ‘bad’ we tend to eat it quicker, often not engaging in the actual process of eating, and we eat more of it at any one time as it’s the last time we will ever eat that food. This negates the very reason for consuming it in the first place, as we typically eat them for pleasure and satisfaction. Except almost the opposite it true; instead of pleasure we feel guilt. Typically, these are adjusted tastes; there was once a time where we thought trim milk was insipid, low fat cottage cheese was watery and and edam cheese was bland. Once our taste buds had adjusted, we could smell a full fat milk cappuccino a mile away. It is not just a psychological hurdle to overcome, indeed research last year found that taste buds physically change (one of the first scientific studies to ‘prove’ what anecdotally we have been saying for years). It does take time, though – and repeated exposure to a previously disliked food eventually results in acceptance. This physiological response to fat in food extends to the digestive processes. Certain enzymes responsible for the digestion of fat in the gut may be down-regulated if that pathway has not been utilised, therefore some people physically have problems digesting a diet higher in fat after years of omitting it from their diet. People with poor functioning liver or gall bladder may also have problems digesting fat, as the liver is the site of nutrient metabolism, and the gall bladder is responsible for secreting bile that is essential for fat digestion. Further, if you have irritable bowel syndrome and a sensitivity to FODMAP containing foods (specifically polyols), and have included additional coconut-based products in your diet, then this could explain some of the gastrointestinal distress. Do it slowly. Instead of focusing on adding a lot of additional butter, olive oil, coconut oil to your food, just think about not removing the fat that is already present. Instead of automatically going for the low fat cream cheese, pick the regular variety. Choose the standard milk as opposed to the trim milk. Go for the darker cuts of meat on a chicken as opposed to the lean breast (a lot more nutritious) and don’t worry so much about removing the skin. Eat butter. Listen to your appetite. Fat has the ability to make you feel more satisfied after eating it, so really try to tune into your hunger cues and stop eating when you feel satisfied, not stuffed. Add a small amount of butter to steamed green vegetables. You do not need to drown them in it. This will help increase your absorption of fat soluble vitamins A, D, E and K which require fat as the vehicle to be able to be utilised. As your taste buds adjust, you can increase the amount used. Add olive oil-based dressing to your salad greens. Increase the ¼ of an avocado to ½ an avocado. Make your omelettes with the whole egg and not just the egg white. If you do have a sluggish digestive system, helping support your liver by drinking raw apple cider vinegar in water 20 minutes before meals helps stimulate stomach acid and can help detox the liver. Bile salts help stimulate the production of bile from the gall bladder, essential for the digestion of fat. Add nuts and seeds to your smoothies and salads. Choose coconut cream to mash into pumpkin or kumara instead of milk. Physically, you’ll soon adjust to a higher fat content without associated gastrointestinal distress. Psychologically, while you may not initially trust that you can increase the fat without gaining weight, you just need to remember to cue into your hunger cues and notice how you feel after eating. What really counts aren’t the calories – it’s the quality of those calories. Incorporating more of what is offered naturally in the way of food choices is far more nourishing and satisfying than any kind of packaged snack. However, if you choose to eat packaged snack foods then just do it and don’t feel guilty. Regardless of what you eat, the concept of ‘guilt-free’ foods and the unintended meanings should have no place in determining what we eat or, more importantly, how we feel. *Obviously I’m not talking about all vegetarians, as there are many reasons why people choose not to consume meat. This is, however, a common one.